(Phys.org)—Computers are often described with "ones and zeros," referring to their binary nature: each memory element stores data in two states. But there is no fundamental reason why there should be just two. In a new study, researchers have designed a magnetic element that has six stable magnetic states, which paves the way toward realizing a six-state magnetic memory element. 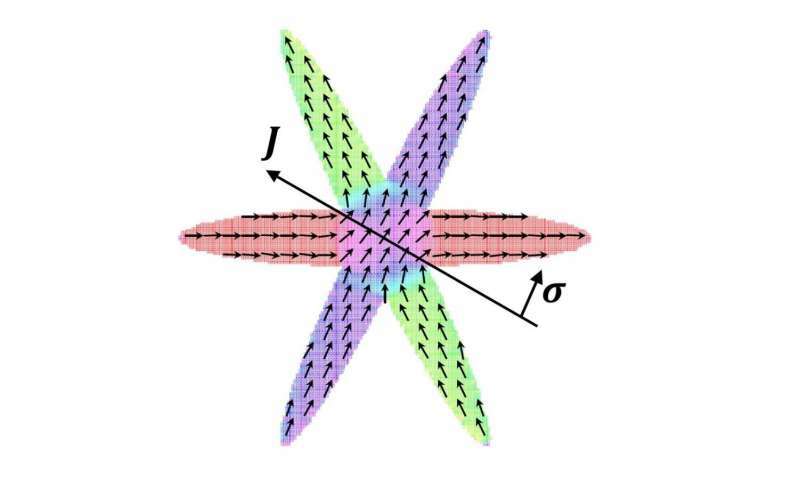 The researchers, Yevgeniy Telepinsky et al., from Bar-Ilan University in Israel and New York University in the US, have published a paper on the new magnetic structure in a recent issue of Applied Physics Letters. This isn't the first time that researchers have designed memory cells with more than two states, or bits. The best-known example is multi-level flash memory cells, which can store up to four bits per cell. While multi-level flash cells have advantages such as a higher density and lower cost, they also suffer intrinsic drawbacks such as lower writing speeds and higher power consumption. The new six-state memory element presented here is different because it is magnetic, whereas flash memory is electronic. Although electronic memories are currently the most commonly used type of memory, various types of magnetic random access memory (MRAM) are being actively researched due to advantages in low power consumption, fast operation, and long lifetime. "Our proposal paves the way for enjoying the benefits of multi-level cells in MRAM, making it even more attractive for applications," Lior Klein, a physics professor at Bar-Ilan University and one of the study's lead authors, told Phys.org. "Furthermore, since MRAM is different in its nature from flash, there is no reason that it should suffer from the drawbacks of multi-level-cell flash memory." 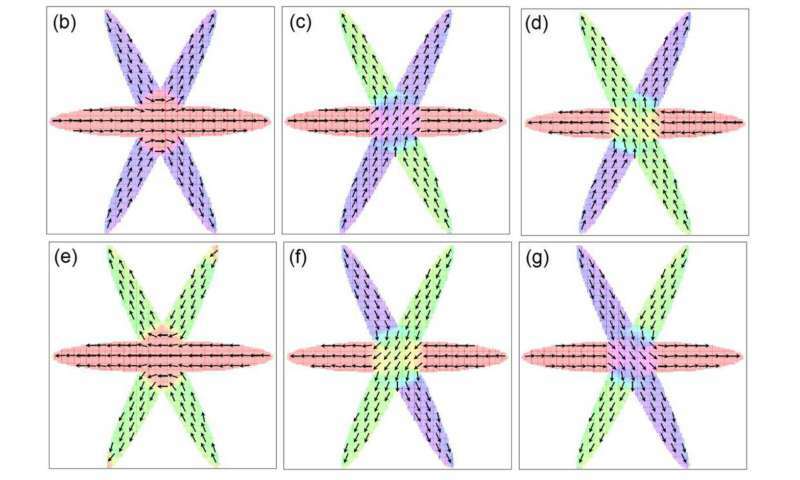 Realizing the six-state magnetic element does not require any significant increase in complexity, such as adding layers, but rather involves simply structuring one of the magnetic layers differently—specifically, arranging the magnetic film into a pattern of three crossing ellipses. In the middle region where all three ellipses overlap, the researchers found that there are six different stable magnetic orientations. The orientations are parallel to the long axis of each ellipse, and can run in two opposite directions. If such a pattern with six magnetic orientations can be controlled and incorporated in a magnetic memory element, then the number of memory states can be increased from two to six. The researchers showed that such control is possible by using a technique called spin-orbit torque switching, which uses spin-polarized electric current to switch between magnetic states. This demonstration shows that the spin-orbit torques can write data onto the magnetic structure, showing the potential for using the structure as a memory element. The main advantage of having six states is that it would increase the memory density while avoiding the problems inherent in miniaturization. Currently the primary strategy for increasing memory density is to miniaturize each memory element so that more of them can fit on a chip. However, at these small scales, the memory elements are so close together that they begin to interfere with each other's states. The new design can avoid this problem, and also offers other advantages. "Going from two to six states would triple the density under certain conditions (for example, maintaining the lateral scale of the bit)," Klein said. "In addition, other advantages are also expected. The cost of the memory would probably decrease significantly, and when such bits are incorporated in a magnetic memory array, we may witness other benefits such as increased reading speeds." The researchers expect that it may be possible to design patterns with even more magnetic states. For example, their simulations show that a pattern of four crossing ellipses would yield a memory element with eight magnetic memory states. "We intend to further increase the number of magnetic states and explore the limits of such an extrapolation," Klein said. "In addition, we would like to progress towards fabricating a prototype that will help us convince the magnetic memory industry to make a shift towards multi-level magnetic memory." This opens the door to using "octal" base math where each of the numbers from 1 - 7 are available, not just a 0 and 1 as in binary base math. The storage capabilities are enormous. This opens the door to using "octal" base math where each of the numbers from 1 - 7 are available, not just a 0 and 1 as in binary base math. . .
Not quite. Octal is base-8 (thus the "octa") and uses the numbers 0-7. The encoding described here is base-6 (senary or heximal), using the numbers 0-5. 6 states is 2.6 bits. 2.5849625007 bits to be more accurate. That's what makes it quite inconvenient to translate to and from binary. The only integer solution that would solve 2^n = 6^m is zero, which means there is no number of these elements that would accurately represent a binary number without wasting states. The best you can do is pick a number that's close, like two elements with 36 states combined, and ignore the extra 4 states to represent 5 bits in binary and lose about 3% of the encoding efficiency.